Washington, D.C., July 26, 2012--The Washington International Horse Show (WIHS), is pleased to announce the 2012 WIHS Prize List, which includes several exciting changes to the show program, is now available online. The country's leading metropolitan indoor equestrian event, now in its 54th year, will take place October 23-28, 2012 at Verizon Center in downtown Washington, D.C. The U. S. Equestrian Federation (USEF) has granted WIHS a presidential modification to increase the number of WIHS Equitation Finalists to 40 (from 35), with 10 spots available to qualifiers from the West Coast League and 30 from the East Coast League. The increase will give more riders the opportunity to compete in one of the most prestigious equitation finals in North America. WIHS will also introduce the Amateur-Owner 3'3” Hunter division for the first time with 20 entries accepted, 10 each in the 18-35 and 36 & over age groups. Entries must be postmarked by midnight September 4. The qualifying period ends August 29, except for the WIHS Children’s and Adult Hunter and Jumper Championships, which ends August 31. For more details, download the Official WIHS Prize List at www.wihs.org/prize-list/. Entries may also be submitted using Equestrian Connect. Nearly half a million dollars in prize money and special awards will be presented at the show, including Washington favorites like special treats from Georgetown Cupcake and luxury timepieces for the leading hunter and jumper riders, courtesy of Tiny Jewel Box. Some of the industry’s most respected judges will preside over this year’s competition, including McLain Ward, Alison Robitaille and Todd Karn for the WIHS Equitation Finals; Ralph Caristo, Jimmy Clapperton and Scott Williamson for the hunters and Ralph Alfano, Neil O'Connor and John Taylor for the jumpers. WIHS is one of the most historic and well-known equestrian events in the world with a significant record of hosting Olympians, national champions, our country’s most talented young equitation riders, and top ranking junior, amateur and pony competitors, all of whom take to the ring each October in the nation’s capital. Nationally, WIHS is rated “AA,” the highest possible, by USEF. On the international level, it has a three-star (CSI 3*-W) rating from the International Equestrian Federation (FEI). The ‘W’ indicates the show is one of a select few in the U.S. offering a prestigious World Cup qualifying class. At Washington, the highlight event of show week, the $100,000 President's Cup Grand Prix, is a World Cup qualifier. In related news, the Washington International’s sister show, the WIHS Regional Horse Show, October 19-21, 2012, Prince George’s Equestrian Center, Upper Marlboro, MD, will now be “C” rated, and will once again host the U. S. Hunter Jumper Association (USHJA) Zone 3 Finals. A very popular stop on the local horse show circuit, the WIHS Regional also offers an alternative way for area riders to qualify for competition at Verizon Center. Download the 2012 Official WIHS Prize List at www.wihs.org/prize-list/. Learn more about the Washington International and the WIHS Regional Horse Show & USHJA Zone 3 Finals at www.wihs.org. Join us on Facebook and follow us on Twitter. 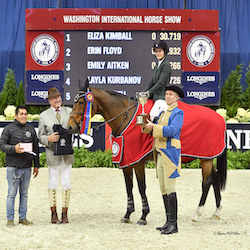 An equestrian tradition since 1958, the Washington International Horse Show is the country’s only metropolitan indoor horse show and the pinnacle of the equestrian year with top riders, including Olympic medalists and their world-class horses. More than 500 horses participate in show jumping, hunter and equitation events during the six-day show, with many competing all year just to qualify. Highlights include the $100,000 President’s Cup Grand Prix (a World Cup qualifier), the Puissance (high jump) and WIHS Equitation Finals featuring the country’s top junior riders. Exciting equestrian exhibitions, boutique shopping and community activities, such as Kids' Day and Breakfast with the Mounted Police, round out this family-friendly event.